I was going to attempt to dismiss Control with one of the summary one-line putdowns I so childishly enjoy coming up with but it’s not really amenable to that (my initial thought was. “Can’t wait for the sequel. “Control 2." "He’s lost control….AGAIN!!!! !”) It’s not that “Control” really justifies much time or serious thought, it’s more that it gets it wrong in so many different ways that its badness resists simple summary. First off I should acknowledge that I’m Curtis-neutral. I think Joy Division are alright, I only own one record by them (though trust me I’ve heard them plenty) “Unknown Pleasures” and I can’t remember the last time I listened to it. No, actually I can, it was about ten years ago. I can only imagine that if you are a “fan”, and not simply one who is going to be blown away by the mere fact that this is a film about Joy Division!!!! 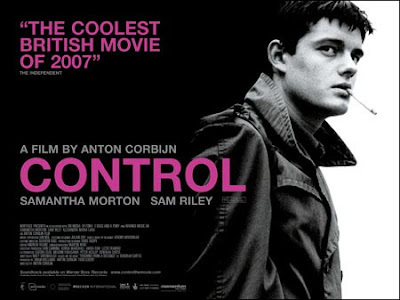 "Control" is even more disappointing. Basically “Control” feels like a slick, unrisky, bet-hedging contribution to the ever-expanding Joy Division industry, falling (like a clumsy, sample-laden proctologist!) between several stools. Its take isn’t on the band themselves, there’s nothing at all about the (excuse my French) “creative process”, gigging, the economics and mechanics of the Biz, studio time with legendary producer Martin Hannett etc. In fact “Twenty four hour party people” spent more time on the process of recording and playing than “Control” does, and despite having much more time to devote to the other band members than TFHPP they come off as ciphers, largely on the same terms, Peter Hook’s a vulgarian, boyish Bernard’s the “nice” one, Tony Wilson (here also almost exactly modelled off the abysmally limited Steve Coogan’s very Partridge-esque and un-Wilsonian non-impersonation in TFHPP) is a ludicrous fop. In one of its clumsier moments, and there are plenty, Curtis comes home and looks at his daughter in her crib. A reverse point-of-view shot cages Curtis in the crib's bars, the prison that is fatherhood and domesticity. It’s unintentionally comic, but lacking any more subtle or elaborated sense of just why the role of father and husband is so awful, any concrete sense of the daily attrition and compromises, the expectations and urges on both sides it has to resort to Big Signifiers. There are two moments of equally monumental semi-comical clunk: both of them revolve around the use of classic Joy Division tunes. The first is the moment when Ian confesses to Debs that he might not love her anymore, the lines on the road striking a symbolic divide between them. As she walks away “ Love will tear us apart” strikes up. See! Love really was tearing them apart. It’s tremendously unsubtle, as is the even more clichéd discovery of Curtis’ body, a shot that holds on the outside of the house as Deborah enters. We wait for the inevitable scream of recognition. How long will it be…..maybe she’s nipped upstairs for a piss, or worse, it could be ten minutes before she gets to the kitchen. AAAAGGGHHH!!!!!!. Ah, there we go. In comes “Atmosphere” with a resounding clunk as Morton emerges distraught into the street. Let’s not even get on to the final shot of Curtis’ ashes dispersing themselves into the sky as he achieves a kind of invisible, over-arching artistic immortality becoming somehow part of the very “Atmosphere” we breathe. “We are all Ian Curtis!” Or something. And while it seems mean- spirited to say so, much additional clunk is also added by the use of Curtis’ own letters and notes, none of which sound anything other than utterly banal, we know he really meant it, man, but it’s still doggerel. Where the film’s good is in the band’s performances, the rawer, punkier kinetic kick of the live sound and at the other extreme, its depiction of depression as a slow implosion, a closing down of the idea of any possibility of movement or change, a draining away of the will. Cormac Mc Carthy’s apocalyptic “dimming away of the world” is really a description of depression's slow leeching of light and vital energy both from without and within, a trajectory you’ve found yourself on, pulling you out past the world of normal concerns and relations and into a paralysed no-man’s land. Curtis grows progressively more mute and sunken and in the final scenes of him watching TV and wandering round the house he’s already dead, inescapably entering a kind of negative velocity, a collapsing of linear time and forward momentum into a point of absolute density and stasis, the universe rushing back to a point of terminal contraction. His eyes half closed, words barely accessible to him, unreachably distant, he may as well be on the moon. But, all in all it feels like a missed opportunity, one more hollow hagiography. Or maybe more of a marketing opportunity, my DVD came with a few adds for Cds and books before the film. I ask you, is this what Sid died for? Or Ian for that matter? It was the pram in the hall wot dun it. He's told me to tell you that I am an idiot. I shall have to distract him by doing pig impressions, as per usual. tell him i say HE is an idiot, that i'm the size of a mountain and that if he doesn't stop it now i'll come round and sit on him till he cries and swears to never again enemy your promise. Well, now that I've finally seen it, and though I'll never cease to be amazed that a man could prefer Cop Shoot Cop to Joy Division...well, you're right, aren't you old chap. The moments of clunkiness you mention ('Love is actually tearing us apart' moment esp) are indeed utterly clunky, and I think you're right about the near-saving graces such as the 'already-dead' last few days (Sam Riley is very good in the same way that Sheryl Lee was in Fire Walk with Me - someone who clearly isn't a great actor nevertheless having a total commitment to a ridiculously difficult part - but the wide-eyed innocence is a tad overplayed). - also, the audience looked like Hoxton hipsters, which got in the way rather. Everyone was too good looking throughout, really. It was never hard enough. I mean look at this and then at Corbijn, and the difference is immense. Stylisation isn't the problem, but a failed stylisation. It did irritate me a little less than 24 Hour... though. Incidentally, I presume you've read the Fangirl takeon the rather dubious sexual politics? What I would prefer would be a film that was of Joy Division rather than about them - as in the way that Velvet Goldmine doesn't need a single Bowie song to make clear that it understands glam perfectly. A trickier idea to sell, I imagine.